You Can't Take It With You but you can treat yourself to a lovely vacation home in an ideal location! 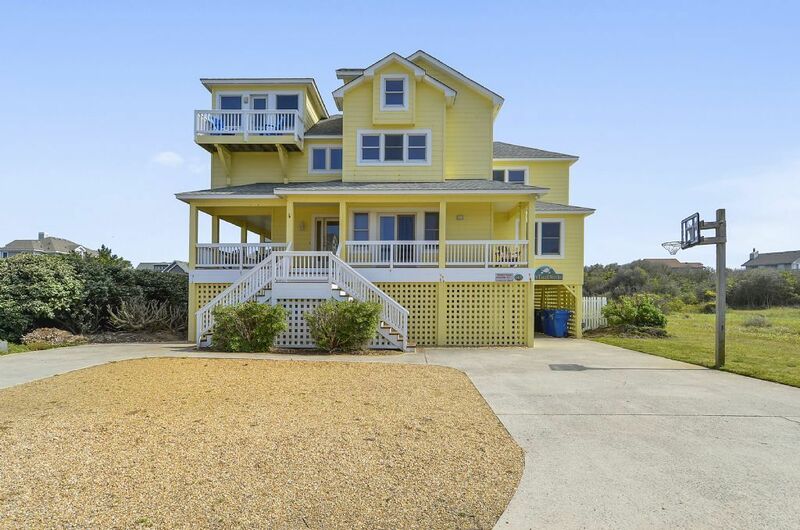 Located in the Duck Landing subdivision in the heart of Duck Village, this 8 bedroom, 7.5 bath getaway is steps from the beach access and directly next to the community indoor heated pool and outdoor tennis courts. Can't Take It With You has a back yard set up to be your own private playground with regulation volleyball and horseshoe courts, as well as a hot tub and private heated* pool with a slide. Walk to the beach during the day and walk out to the shops and restaurants in the Village of Duck in the evenings. DISTANCE TO BEACH ACCESS: Only about 190 feet to beach access. UPPER LEVEL you will find the main living area featuring a 65" SMART LG TV with Bose 5.0 Sound Bar, kitchen and master suite as well as a small office in case need to do some work while you're away. LOFT LEVEL, another floor higher, you'll find one loft area is a master bedroom while the other is a sitting room with built-in seating and gorgeous ocean views. GROUND LEVEL features two bedrooms on the ground level that share a bathroom and a game room with a pool table, foosball, kitchenette and TV area. GREAT ESCAPES STANDARD AMENITIES: Central Heat/AC; Color TV with Cable or Satellite**; DVD Player; Radio, Stereo or Docking Station; Cleaning Tools; Baby Gate; High Chair; Portable Crib or Pac-n-Play; Pillows; Blankets; Washer/Dryer; Iron & Board; 5 Beach Chairs; Deck Furniture; BBQ Grill; Outside Shower. Kitchen Furnished with Dishwasher; Microwave; Blender; Coffee Maker; Mixer; Icemaker or Trays; Pots, Pans and Ovenware; Dishes; Eating, Preparing and Serving Utensils. CAN'T TAKE IT WITH YOU EXTRA AMENITIES: Private Heated Pool*; Hot Tub; Fireplace; Satellite TV; Foosball; Pool Table; Volleyball Court; Ice Machine Charcoal & Gas Grill; Basketball Goal; Community Club House,Indoor Pool, Tennis & Fitness Center. NO SMOKING. **11 TVs with Cable Access (Including each bedroom, Living Room, Den and Game Room). 8 BEDROOMS Accomodate 18 guests in 4 King Masters, 2 Queen Masters, 1 Queen Standard, 1 Standard room with 2 sets of Twin bunks. Sheets are Provided for each bed (sheets for 2 sofabeds provided upon request), with the beds made for your first night (top bunks are not made). Bath Sets (Bath Towel, Hand Towel, Washcloth) are Provided for 18. POOL HEATING: Available at an additional charge ($100-$200, depending on month). Pool Heat option allows the ool to be heated by a heat pump device. Please kno that actual water temperature will be dependent on the ambient air temperature and a specific temperature cannot be guaranteed. CAN'T TAKE IT WITH YOU an ultimate family vacation home. Make it your GREAT ESCAPE today! Robin, Sorry you were not happy with this home. I have passed your comments on to management as the owner. Thanks for letting us know. Perfect location!! Perfect distance to beach and a nice walking distance into town. Enjoyed our stay. Our family of 13 stayed at this house during Thanksgiving werk and found it well appointed and comfortable. Our grandsons really enjoyed the Community Center which is next door. The only thing I missed just a little was an elevator! So glad you and your crew enjoyed your holiday stay at CAN'T TAKE IT WITH YOU. Glad we had (almost) everything you needed. Let us know when we can help you in again! The house was perfect for our crew. The house had great sitting rooms for quiet time for those that sought it. The pool area and beach access were great. The pool and beach toys on the property were a plus. Would definitely rent again. All the things we love to hear about in a vacation home....Peace-check. Easy Access Points-Check. Toys-Check. Thanks for taking time to pass on your experience. We will definitely love to see you again! Location better than anticipated! Pool, hot tub, outdoor showers were clean and well maintained. Indoor space perfect for our family of 10 adults and 4 kids 2 and under plus one dog. Not a lot of Knick knacks for us to move which we appreciated. We liked the fact that the kitchen was well stocked with cookware etc as we ate in 5 out of 6 nights. The kitchen could use some updating as tile floor was cracked in several places and Counter tops were Formica but in good condition. The one thing we really appreciated was the House was spotless which says a lot to our family even though it had some wear. Realtor stayed in contact with us as hurricane Florence was headed for the outer banks but missed Duck and hit heavily further south. We only lost Saturday and were able to enter Duck Sunday morning at 7am. CAN'T TAKE IT WITH YOU is one of those home that is in the sweet spot location. Close to the beach, easy walk to town activities and shopping. We try to keep the vacationer in mind with things to use while vacationing. Off season is coming and will take your updating comments under consideration. Thanks for taking time to help shoppers choose a home for vacation. Great house super close to beach! Thanks for taking time to share your thoughts about CAN'T TAKE IT WITH YOU. You almost can't beat this location. Hope your memories of this week last until we see you again! heated indoor pool next door in clubhouse! regulation volleyball and horseshoe pit!